I had a terrible procrastination time when I had depression. I’d play solitaire for hours and when that became boring, I just walked in circles in my room! I read lots of advice but still procrastinated. And then I stopped caring and it stopped, but that was at the same time that Prozac started working. Now, what helps me most is motivation. I have many goals that I loose from sight. So, I try reminding myself loud and clear: “exam coming! study *now*! that’s all you can do”. The clearer the reminder, the better: my school timetable right in my face reminds me pretty well of all the subjects I have to work on. The best thing I ever did to curb procrastination was delete my facebook account. No more pointless hours prying into the lives of people I’d forgotten about or stopped caring about years ago. I also find that playing one song on repeat constantly (usually on headphones) helps me to focus on what I’m doing and block out potential procrastination opportunities. I recently started using this site to help me with being overwhelmed with house cleaning & procrastinating about it. In psychology class, I learned that goals are more readily accomplished if they are designed to be specific (I will lose five pounds by March 25), measurable (hop on the scale), and doable (realistic, not 50 pounds in 8 weeks). I also learned that people who are more likely to achieve their goals design backup plans at the beginning–that is, if they miss, say a goal to run on Thursday, they already have a backup plan to run on Saturday instead. 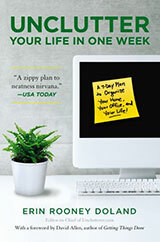 Having a backup plan to begin with fits better with the time and plan interruptions in life that happen to all of us. I write down not only a list of goals, but of the steps needed to achieve them. Then I review them regularly. It also helps to pencil things in on a calendar and set aside time for them. Most of my procrastination comes in response to repetitive tasks that I think will take a long time (like dusting the first floor or cleaning the kitchen) or things that I just hate doing (like grading). For the first set, I time the activity and keep a note of that. So for example, I tend to see dusting as a half day thing when it only takes about a half hour (and seems like less when I am listening to a podcast); in the same way, cleaning the kitchen takes about 5-10 minutes since we tend to clean as we cook etc. For the second set, I use a timer or other “counting” system to get myself through it. So, if I am grading, I group the assignments in sets of six (all my students turn in all work on-line and the file system displays the work in rows of three). After each group of six, I can take a 10 minute break. Using this system, I find myself pushing myself with individual goals–like if I do nine this time, then I will only have 6 left, etc. Breaking it down into manageable units and being realistic about how long things actually take really help me. I set time limits for doing something. For example, I write every morning after I drop my son off at school. I set aside and hour and a half to write, but only make myself write for an hour. 9 times out of ten, I’m still writing after the first hour has gone by. I also try to tackle tasks that are important and/or have deadlines first. Another little trick I have if I’d really rather being watching tv or playing a game instead of working, I promise myself a limited amount of fun time as a reward for completely a task. A cup of hot tea or coffee also lightens my mood enough to make completing a painful task more enjoyable. I’ll get around to reading this blog post later. If it’s something really daunting and I just don’t want to do it, or I’m intimidated by the thought of starting, I set a timer for half an hour, and during that half an hour I have to work on it and nothing else. After a half hour, I can do something else or keep working, and I usually want to keep working because by that time I’ve gotten into it. From there I reset the timer for another half hour, and so on. At work, I tell myself that the sooner I get something over with, the less nagging I will get from the person whose crisis du jour I’m solving. (I have some impatient coworkers.) At home, well, I’ll let you know if I ever figure that one out! The stronger the commitment, the harder it is to break. If I just think about doing something once, it is far less likely to happen than if I were to write it on a to-do list. If it is of greater risk of being put off, then I like to make a commitment to one of my peers. This way you have the support (or fear of being ostracised) as a very strong motivator. The need for a stronger commitment becomes less with practice, and I now find it is easier to keep promises to myself, and beat procrastination in its tracks. Making a “to do” list for the day and checking off what I’ve done. Also, if something can be done in 2 minutes or under, just do it….NOW!! @ Jess – good tip about deleting Facebook. I am considering just keeping one social networking account! It’s exhausting keeping up with everyone else’s lives. Instead of dreading going to the gym, I just think “getting into the jog bra is the hardest part of the workout” It reminds me of how good if will feel to do the workout. I like crossing things off my list and I actually draw little check boxes next to the list. I have heard of other people who list the things they DID, and enjoy adding to the list as they accomplish the chores. Eliminate distractions. If web surfing is calling my name, I take my papers into a different room to work on. Procrastinating is a real bugbear for me. I quite literally have bipolar disorder, and the procrastination is worse by far when I’m very depressed. I do better than I used to about motivating myself at other times but I’m far from a role model in this area. My high school program (a long time ago) used the word procrastination often to make us students feel guilty for not working constantly. They still do it to current students. To this day, I hate the word. Procrastination isn’t necessarily a bad thing; some tasks require you to be in the right mind, or alertness, or mood, and if you try to do it at a bad time just to get it done, you may fail or do a poor job. As a database administrator, sometimes I need to go work on something else for a while in order to clear my head to fix a problem. Sleeping on a problem is also good. Procrastinating can be bad, obviously, but I wish some of the guilt could be taken away from the word. We’re all human and prone to distraction and laziness, but that’s better than overdoing things, burning out, and never enjoying ourselves. I also find that justifying why the task is on your todo list in the first place helps. Find a reason that directly impacts your life in a physical or mental way if you don’t complete the task. Often linking the importance of things to possible the possible ailment that not accomplishing said task may lead to is greater than the pain of just doing the task — hence your justification for doing it in the first place. I will echo what Craftistic said about setting SMART goals. I think it’s similar to what Barbara Tato and some other said about making your goals specific and realistic for you to accomplish. What also helps me is to write a list of things I need to do in my planner/calendar. I also make sure I look at this list in the mornings. That may sound obvious, but there are days where I will forget to pull out my list till later in the day, or think I remember everything on there. Even if I do remember what’s on the list, seeing everything in writing and being able to cross things off helps me get to the task! Depending on the task, also setting time limits (I need to do this for at least 15 minutes) can be useful and also listening to music or trying to make it more fun will help not procrastinate. And finally, if it’s work related, I think about the consequences of my procrastination– will it delay someone else’s work? Will it have an effect that gives my boss an unfavorable impression of me? Will it cause me or someone else more work down the road? I am much less likely to procrastinate work activities than personal activities since there’s a higher chance of having consequence for my actions. I have to say that the best advice that I ever got for “http://feeds.feedburner.com/~r/simplemom/~3/511617202/”>Start Your Day by Eating a Frog. Do the thing that you dread the most first. After that, your day comes up smelling like roses! And it’s such a great feeling! I have procrastinated for so long that my to do list is actually very, very long – however I have a ‘frog’ every morning… and AMAZINGLY I am getting through that list faster than I ever have before. I timeblock. I use http://www.RememberTheMilk.com (recommended by this site a few months back) and I’m learning what causes the procrastination. If it’s because I don’t want to do something, I figure out a way to reframe it to make it interesting, I hand it off to someone else to do ($$$) or I cross it off my list permanently. If it’s because of inertia (habit), then I schedule a time when I *will* do it and once I’ve broken through the inaction it’s easy to keep going. If it’s because of fear (of failure, success, judgment, whatever), then I try to figure out a way to let the fear dissipate or I just do it anyway and tell the fear to keep quiet. What they’re basically talking about here are SMART goals. You have to make your goals: Specific, Measurable, Attainable, Realistic, and Time Bound. I’ve read the Procrastinator’s Handbook and it really motivated me to stop procrastinating. 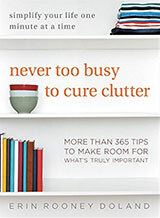 I would say it’s equivalent to Peter Walsh’s book for decluttering. Some great tips in the comments here, thanks everyone! From the queen of procrastination! A to-do list helps me keep track of priorities. Setting a minimum time limit (or distance limit in the case of cycling) helps me get started, and like others have found, once I get started, I often happily exceed the limit I’ve set. Another technique that is very effective for me, is having to be accountable to someone else – eg a having someone coming to visit motivates me to get the housework done. Telling a friend or relative or friend what I plan to do also motivates me to follow through. Even at 39 years old, the fear of my mum’s disapproval is a great motivator! so I often inform her of my intentions: “This weekend I’m going to clean out the hall cupboard/ go for a 30km ride/do my tax return”. I know it will come up in conversation later, and I don’t want to feel caught having to justify why i didn’t get around to something. i usually add something to my list that i less rather do that what it is i’m procrastinating doing. so my choice is clean the house or weed the garden. since i hate housework, i head out into the garden. My problem is not only procrastination but being routinely interrupted by a spouse who does not think he is interrupting as well as tasks that are moved to the front of the burner at the behest of another rather than at my request. I am supposed to act proactively and instead I am acting reactively and I can not get out of this spiral. Great blog. Here’s what I do. Before leaving my hotel room for a presentation I lay out all my workout gear. On returning, there it is staring at me. I never miss a workout!